(1914-1994 )Tatyasaheb Kore was born on 17th Oct. 1914 as a son of a farmer, in a small village Kodoli. Being the eldest in the family, he had to shoulder the family responsibilities. He actively participated in the Quit India Movement of 1942. He was closely associated to late Shri Yashwantrao Chavan, the former Deputy Prime Minister of India. – A freedom fighter and social reformer. – A close associate of Former Dy.Prime Minister Late Yashwantrao Chavan. – A strong believer in Co-operative movement. – A leader who changed barren land into a prosperous area comprising of 70 villages by establishing Warana Co-operative Complex. 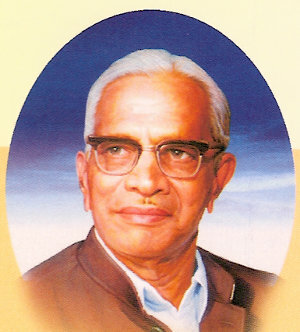 Tatyasaheb believed that “Education alone can revolutionize, create awareness, transform the lives and make the masses to march ahead”, He rightly realized the need of providing education to the kit and kin of the farmers in this rural area Hon’ble Shri Tatyasaheb Kore believed in co-operation as a way of life and attached great importance to its moral content. He was a visionary man with foresight, rare organizational skills and dedication. He was fully aware of the fact that along with the economical prosperity, the rural development and enlightenment is equally important, for which he created educational facilities. He wanted to bring about a total transformation of the rural youth and create a ‘NEW MAN’ , who is well educated, self-reliant, economically sound, rich and morally upright.